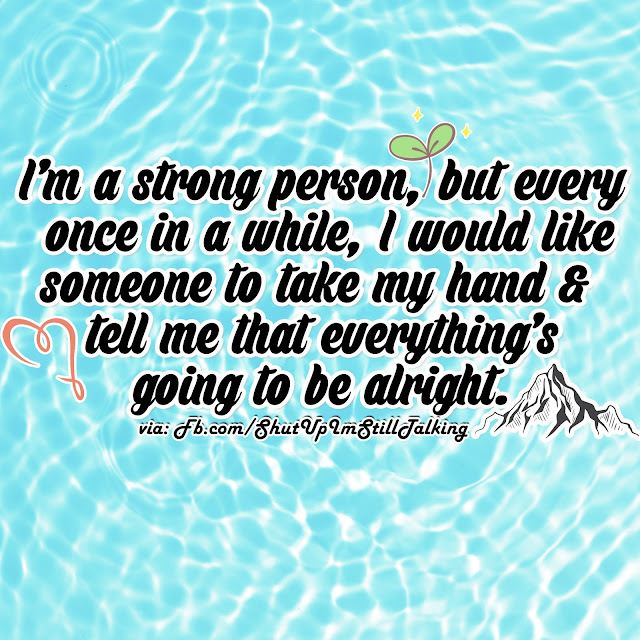 I'm a strong person, but every once in a while, I would like someone to take my hand & tell me that everything's going to be alright. Learning to be my own best friend helped a lot. That's me.I say an extra prayer,and I feel a lot better. Today just need to hear some encouraging words sometimes. That would be the best medicine! I'm a strong person, Inspiring Words of Encouragement picture/image is an Inspirational Stuff to Inspire and Motivate You. You can download pics by just clicking on the Images. Thanks for visiting Truth Follower an online place for huge collection of inspiring pictures, quotation, and Sayings Images. If you like I'm a strong person, Inspiring Words of Encouragement, Please Share with friends and family on Facebook, Twitter, and Pinterest.